"Excellent! Very beautiful house and clean. If you want peace the log ..."
The holiday log cabins Alpinka 1 and Alpinka 2 at the ski resort Krvavec are located on the edge of the ski slopes at Kriška planina and on the edge of a lovely forest. They offer wonderful views over the Alps and the mighty Triglav. The holiday log cabins have an entirely new interior made out of massive wood and offer guests an accommodation at a 4-star level. Alpinka 1 is the bigger holiday log cabin, which can welcome up to 6 adult guests and 2 children. There are two separate bedrooms in the log cabin. One of them is bigger and has two double beds in it – here it is also possible to add an extra bed. In the gallery of the living room a new sofa bed for two can be found. There are bathrooms on both floors of the holiday log cabin. The kitchen is fully equipped and offers a high level of comfort. Alpinka 2 is the smaller holiday log cabin, where up to 4 adult guests and 2 children can stay. There are two separate bedrooms with double beds in the log cabin – it is possible to arrange an additional bed here as well. Bathrooms are located on both floors of the holiday log cabin; the kitchen is fully equipped and offers a high level of comfort. The log cabin gets heated with chopped wood put into a closed fireplace, which nicely warms up all the rooms of the cabin. There is a nice and sunny terrace in front of the holiday log cabin and next to it a great picnic place with a stone grill and a bar made out of massive wood is waiting. Behind the cabin, a covered glass room is available for the guests, which they can use for various sport activities. Here guests can also store their ski equipment and warm their ski boots on the electrical dryers. Firewood is also stored in this room. Guests of Alpinka can use several fun items of the cabin for free: e.g. sledges, bob-sledges and glider sledges, several winter and summer toys, a kid's mountain bike, the swing on the tree, badminton, darts, various balls and a sandbox with several toys. And the main attraction of the cabin house is most definitely the wooden tree house. The wireless internet connection in the cabin is also free of charge. The holiday log cabin is a perfect accommodation option for all those who love to be surrounded by a peaceful unspoilt nature or for all those who wish to spend some quality time with their family, friends or partners on fresh air. The log cabin Alpinka is located on the edge of the ski slopes at Kriška planina and the edge of a lovely pine forest, 1500 meters above sea level. Only a 100 m separate you from the closest ski lift of the ski centre Krvavec. Also nearby is a children’s ski lift, which can be used for free. The log cabin Alpinka at Krvavec is only a good half an hour away from the international airport Jože Pučnik and only 45 minutes by car away from the capital of Slovenia. For guests of the holiday log cabins arriving at the mentioned airport special transfers can be organized. 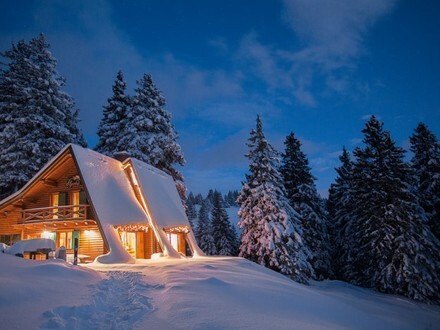 In the summer guests can drive directly to the holiday log cabin with their cars, whereas in winter guests must leave their vehicles because of snow 30 meter away from it. When there is a lot of snow, guests can also be taken from the upper cable car station or the parking space underneath it to the cabins with snowmobiles. Holiday log cabin Alpinka Krvavec. Holiday log cabin Krvavec. Apartment Krvavec.